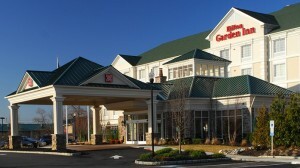 Why Hilton Garden Inn, Hamilton NJ? Make the most of your stay with the latest technology and modern amenities at Hilton Garden Inn Hamilton. Guest Rooms even offer an in-room hospitality center featuring microwave, refrigerator and coffeemaker for your convenience. Upgrade to a Suite for even more space with separate living area and sleeper sofa. Suites are an excellent option for corporate executives and wedding bridal parties. Stay productive at the large desk with two phone lines, dataport, voicemail, and desk-level outlets. Host your next corporate function, business meeting or social occasion at the Hilton Garden Inn Hamilton hotel in flexible banquet space accommodating groups of 10-300 with complete catering and audio/visual services. There’s even complimentary self-parking. After a day’s work or sightseeing, relax in the heated indoor pool and rejuvenate in the whirlpool spa. If you feel like working out in the comfort and privacy of your own room, hire a Stay Fit Kit from reception. Browse the 24-hour Pavilion Pantry for last minute essential items. This convenience mart offers a selection of refrigerated, frozen and microwaveable packaged items perfect for in-room preparation. Remember! Bird Limousine always gives a special discount for any guest of Hilton Garden Inn. Call us anytime we are 24/7.